Evelyn Puerto left a career in health care planning to serve as a missionary for seven years in Russia. 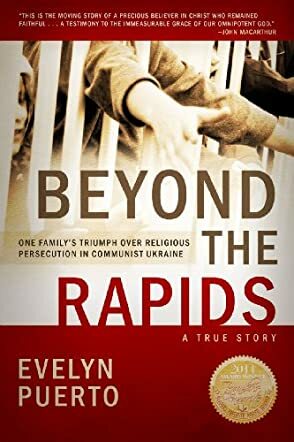 During that time, she travelled several times to Ukraine, where she met and was inspired by the Brynza family, who she wrote about in Beyond the Rapids. She and her husband live in St Louis, MO. For more about the Brynzas and how their example can help you in your walk with Christ, visit beyondtherapids.com. Too many Christians believe persecution is a thing of the past. When they hear the word persecution they think of the early church when Christians were fed to lions. Evelyn Puerto reminds readers that in many countries persecution of Christians still exists. Dr. Alexei Gavrilovich Brynza, his wife Valentine and their four children served the Lord in Zaporozhe in southeastern Ukraine during Soviet rule. Dr. Brynza was a strong Christian and lived his faith despite the consequences. The children attended school and were forced to chant "Lenin Lived, Lenin lives, and Lenin will live forever" along with the other students. The story of the Brynza family is told by the children of the Brynzas. Lena recounts some of the many times when God answered their prayers and how her parents' influence affected her relationship with Christ. Yakov remembers his mother praying for him and the many times when he felt the Lord presence. Life was not easy for the Brynza children. They were stigmatized for their parents' faith. Yakov wanted to be a doctor and repeatedly took the exam to enter the university. In large red letters the word Baptist was written on all his work. He was angry that his father's faith was keeping him out of the university. Yakov was left with a choice, God or country. After much prayer and contemplation, he chose God. This book is a reminder that some day we may each be tested in our faith. Will we stand firm despite the consequences? It is easy for me to say, "Yes, I will," but when confronted with persecution, will I be strong enough in my faith to face what lies ahead? Beyond the Rapids is an incredible story. I was touched by the faith of the Brynzas. Evelyn Puerto brings this story to life. I felt as though I knew the individuals and they were sharing with me. Each individual tells the story through his or her perspective. Each individual faced temptation in some form yet each held true to his/her faith. Puerto tells a story that had to be told. Christians are still persecuted today in China, Libya, Nigeria, Uzbekistan, and in many other nations. By writing this book Puerto shines much needed light on what is going on around the world. Have we become too complacent? I'll have to answer that for myself.